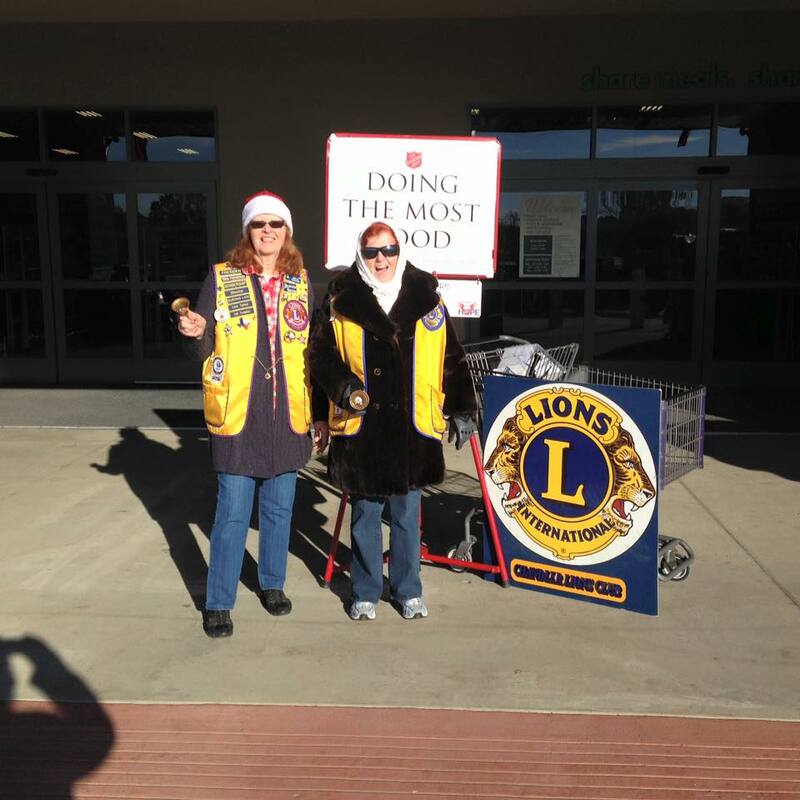 "LIONS BRING CHRISTMAS TO CHANDLER NURSING HOME"
"CHANDLER LIONS RING BELL TO HELP OTHERS"
President Gloria Estes, Margaret Hall and Secretary Ruby Simon (taking the picture), start off a wonderful day of helping the Salvation Army. Chandler Lions all signed up to take time to ring the bell for a great way of serving our community and helping others. I read an article that said this has been a very bad year for the Salvation Army and Red Cross and many other groups. The need for help all over the world is great and we feel this is a wonderful way we as a club can help. The day was a cold one but at the end of it we all had warm hearts and enjoyed the comradery of being part of a wonderful organization. 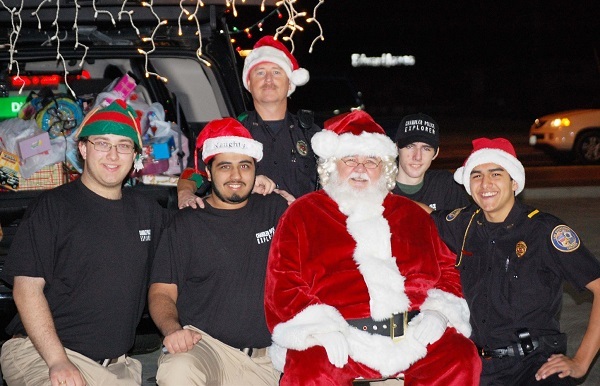 Chandler’s Police Explorers held their Annual Toy drive and the Lions dropped off a car load of toys. We all feel like Santa Elf’s it was a blast to see all the new toys. It was great to see our Club and Community come together for the children. Our club has worked really hard this year to take on new projects to SERVE more to see the smiles and hear the laughter of others. These young men and ladies are learning the true meaning of serving. Every community needs young people who will show their ready to help others. Thanks to Lion and Police office David Patterson who leads this group we are very proud of you and them. 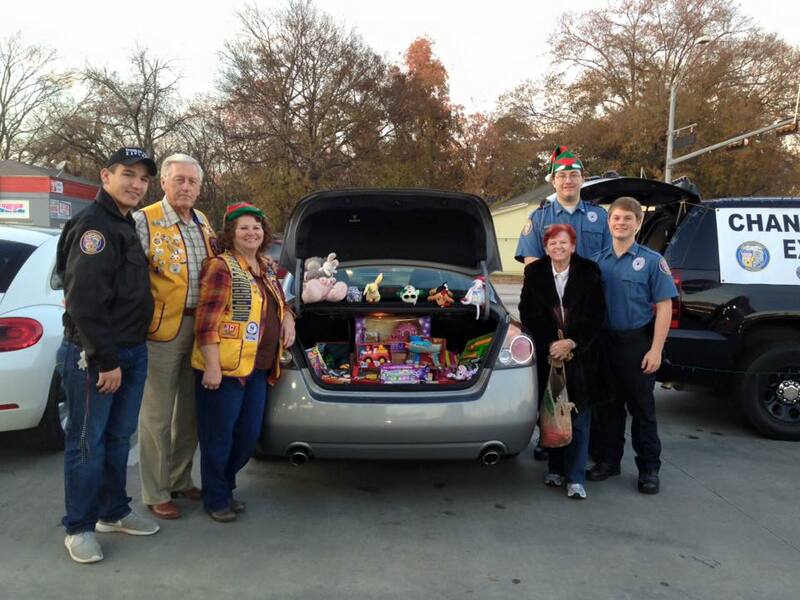 Secretary Ruby Simon and Lions members Jim Simon and Margaret Hall delivered the toys. The Police Explorers were able to give out 164 toys to 41 children helping to make this season a joyful one. 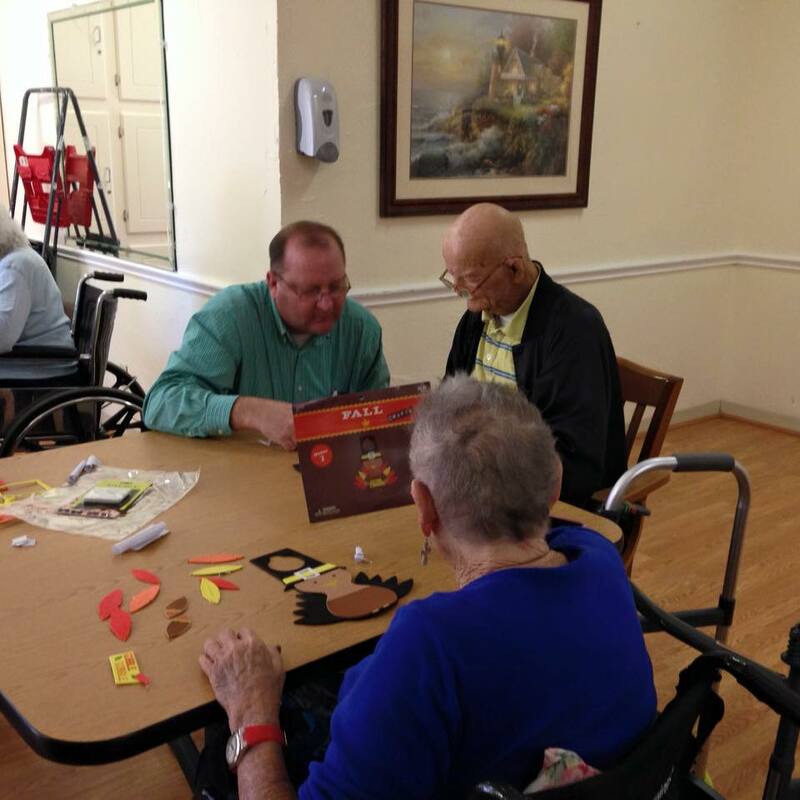 "LIONS CELEBRATE THANKSGIVING WITH CHANDLER RESIDENTS"
The Lions took Thanksgiving day crafts to the Chandler Nursing Home residents and assisted them in making fun holiday items. 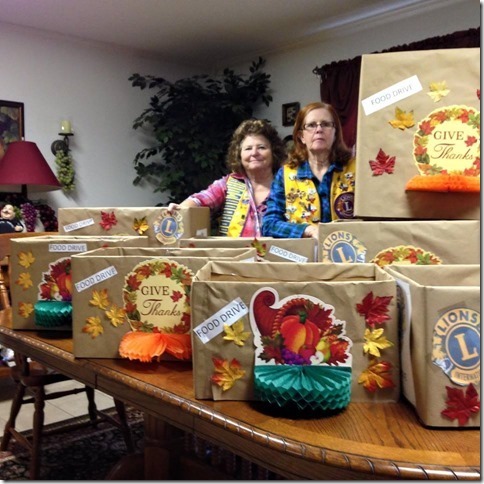 Residents made turkeys and door knob hangers for their rooms with Lions President Gloria Estes, along with Lion Ruby Simon, John Camper, Margaret Hall and Stephanie Adams all had a great time. "CHANDLER LIONS BELIEVE IN HELPING"
As we sit down for our Thanksgiving and Christmas dinners and give thanks remember that others are not as fortunate. We all go about our daily lives and sometimes forget about the thousands that go hungry every day. Chandler has about 300 families a week come to our food bank and about 1200 or more people a month. That number is increasing all the time. Chandler Lions are doing more this year to help by providing food boxes all over town. President Gloria Estes and Lion Ruby Simon put out these boxes before Thanksgiving. We hope this idea will continue in the future to other clubs as a way to help make the holiday season one for all of us to be thankful for. 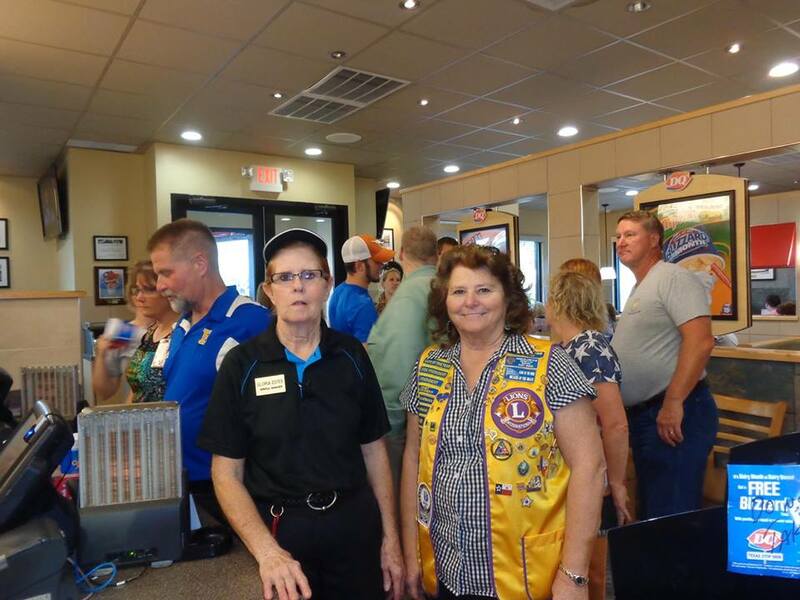 The Chandler Lions club teamed up with Dairy Queen to show thier support for the Brownsboro High School Band. Both organizations helped Brownsboro Band raise money for their trip to Orlando to march in the Russell Athletic Bowl. Lions were there to lend a hand and support the band. The band was great and the cheerleaders were fantastic. 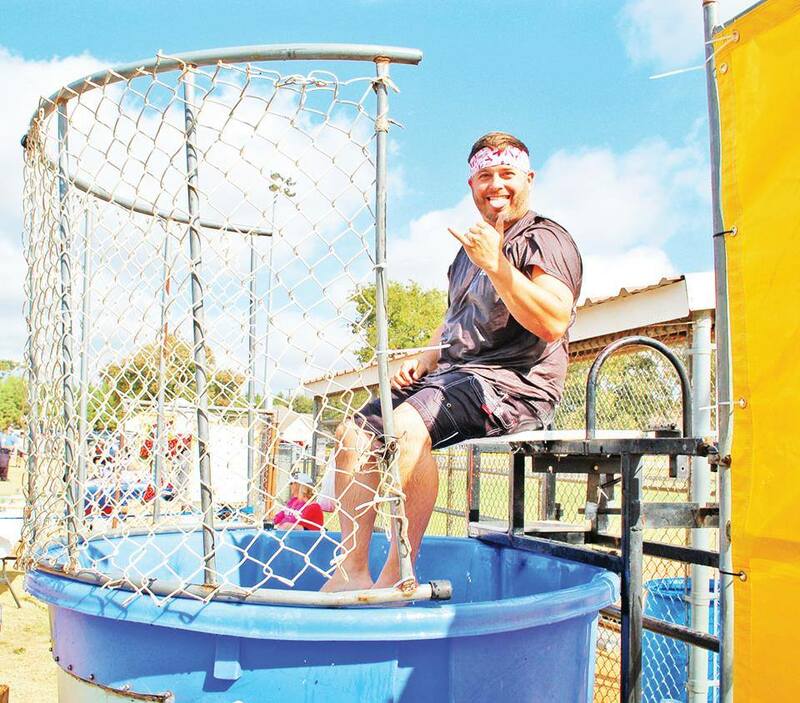 Chandler Lions also sponsored a dunking booth at the POW WOW to help with raising funds for the Bands upcoming trip. Thanks to everyone who came out and showed your support to these talented people. 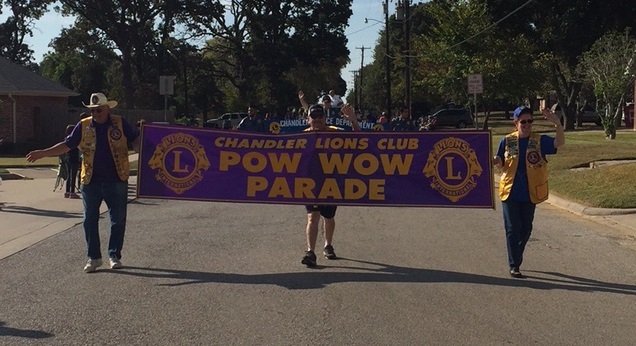 Chandler held its 27th annual POW WOW and Parade on October 10th and thankfully we had a beautiful day for the event. The festivities commenced with the parade, themed "Chandler Suports our Police Officers". Parade Grand Marshall was CPD Chief Ron Reeves is celebrating his 35th anniversary servind as CPD's Chief. The Lions once again organized the parade consisting of approximately forty entries. Overall it as a big success and everyone had a great time. Recently the Lions Club completed training on the use of a device called the Spot Vision Screener. 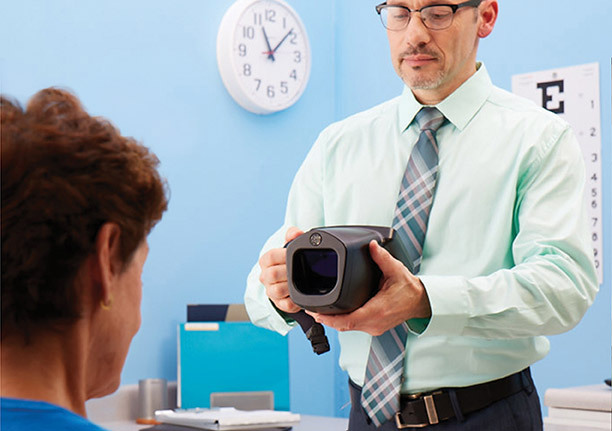 This device is a handheld, portable device designed to help users quickly and accurately detect vision issues on patients from 6 months of age through adults. The Chandler Lions Club will be conducting eye screening in Chandler in January, exact date still being determined. Lions “ROAR’ Chandler Lions came out once again to bring to our community a warm welcoming breakfast. We were up early to serve Pancakes rich with butter, fresh eggs, sausage bright with flavor and big flakey biscuit’s with giant spoons of hot gravy. Hungary yet we were as were our community we cooked two cases of eggs tons of everything else. Lions were there on that bright sunny day to welcome our community and make them feel at home. This breakfast proceeds will help us fund our eyeglass program it will help us to give to our food bank and many other projects. Chandler Lions are BLESSED to have so many friends that support us. Come and enjoy the morning with us! We will be serving eggs, sausage, pancakes, biscuits, and gravy. "CHANDLER LIONS CLUB NEWEST MELVIN JONES AWARD"
Chandler Lions Club is proud of our newest Melvin Jones Fellow, Darla Fink. The Melvin Jones award is the highest honor awarded by LCIF, and she is the sixth in our club in over fifty years. Others Melvin Jones Fellows from the Chandler Lions Club are Tom Bell, Tom Martin, Ruby Simon, Ron Boyda and Charles Fink. 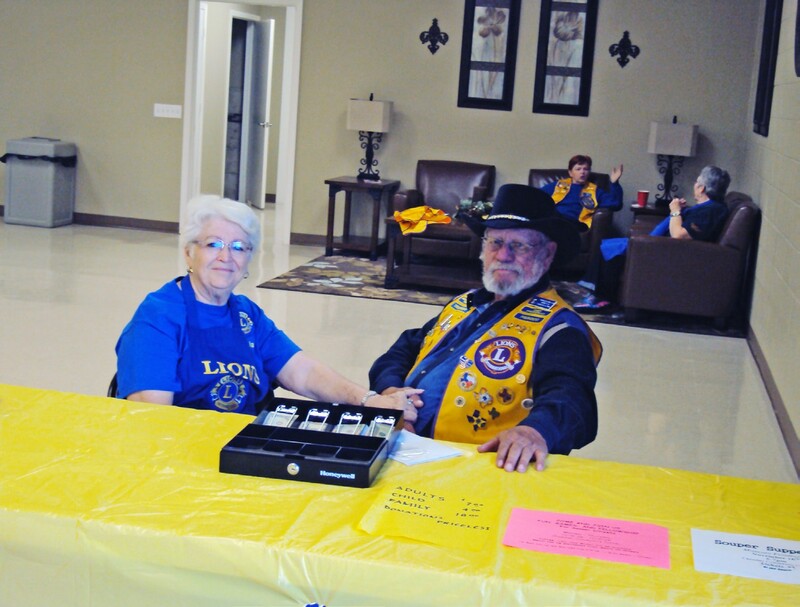 Lion Darla has served as the chairperson on the club’s pancake supper for many years. She also works with other committees, including pow wow, nursing home, chili suppers and our meeting meals. Her service to the club and our community makes her our clubs choice to receive this honor. Lion Darla has not served in any office in the club, but what she gives is sometimes the greatest gift. Darla greets each member with a beautiful smile and warm and friendly hug - gift of love and support to each one of us. 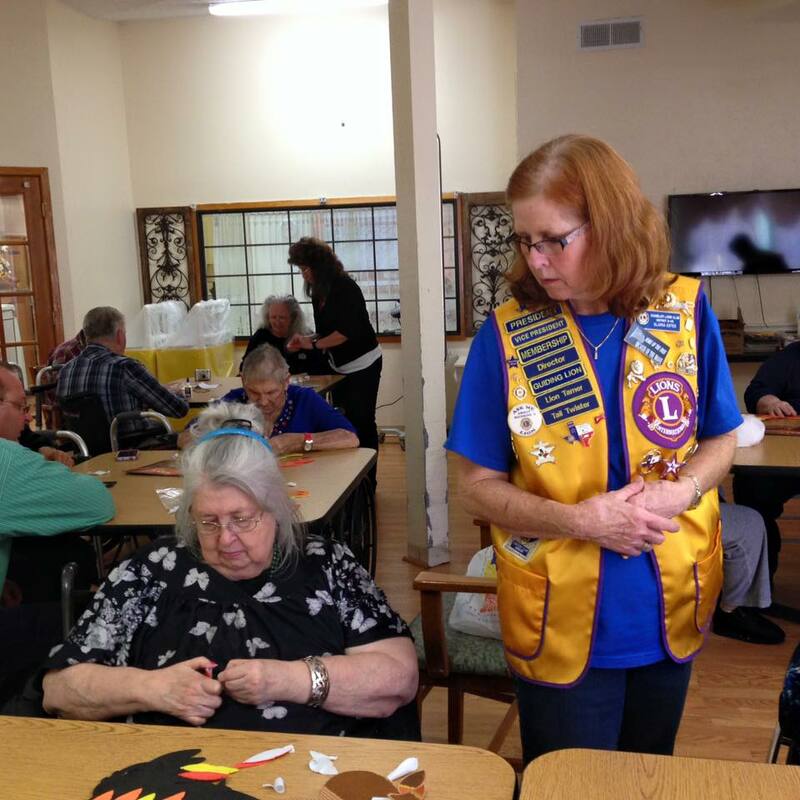 Lion Darla has been a member of the Chandler Lions Club since 2006. 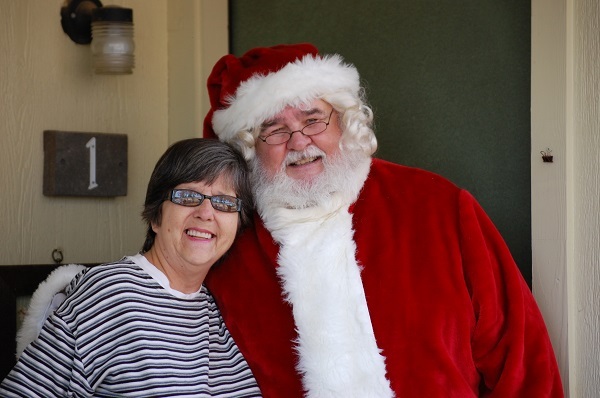 She joined with her husband, Charles, and they both work to support our community. 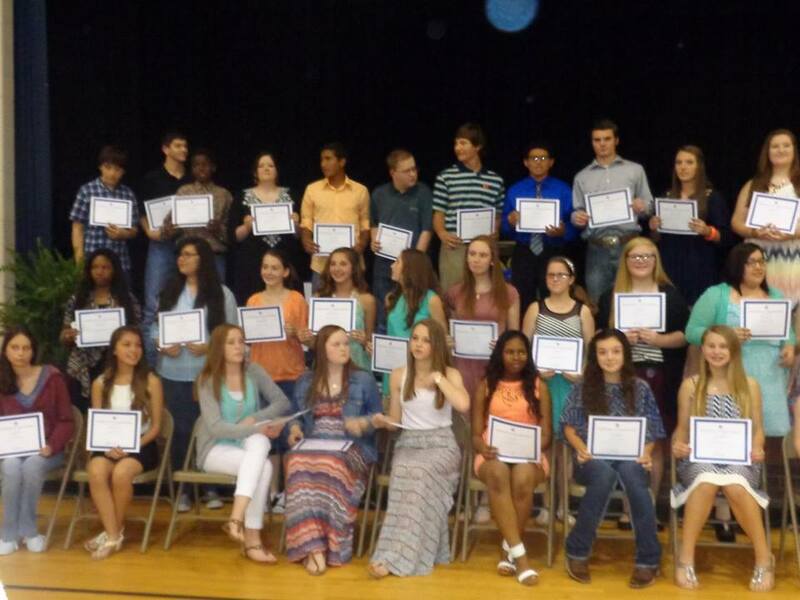 Chandler Lions Club held it’s Brownsboro Independent District Student Recognition Program on May 5th. We were proud and honored to award 36 students with this award. These students are picked by their teachers for citizenship, attendants,grades and overall performance in school. They come to school everyday with a willingness to learn to work hard to treat others with respect. The Motto of every Lions is ‘’ WE SERVE “ we feel these young people are doing just that. We hope they will be our future to work together as a team for all. Our members believe in giving something back to our community, are dedicated to finding people in need and in addressing those needs to efficient and caring ways. Chandler Lions hope to help these young people to grow and become great citizens. 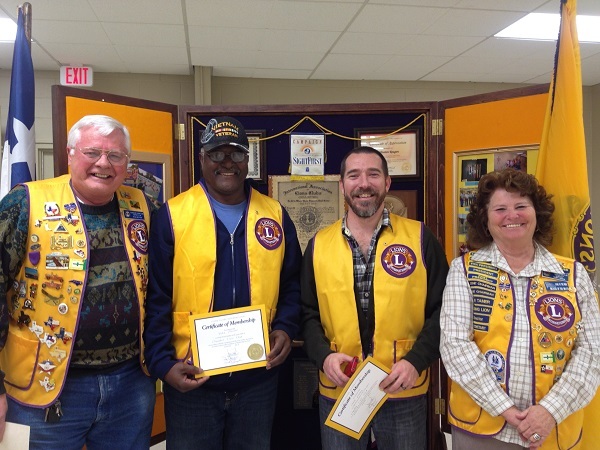 New Lions are welcomed into the Den"
The Chandler lions club welcomed new members John Preston and Steve Kimbley. Both were sworn in and received their new jackets and member pins. Lion Ruby Simon and Ron Boyda assisted with the ceremony. Every year Gene Geiger puts on that red suit with his real beard and round belly and assists Ron Boyda with Meals on Wheels handing out presents and spreading the Christmas cheer. Lion Gene Geiger and David Patterson also participate in the Police Explorer Toy Drive taking pictures and giving out smiles. 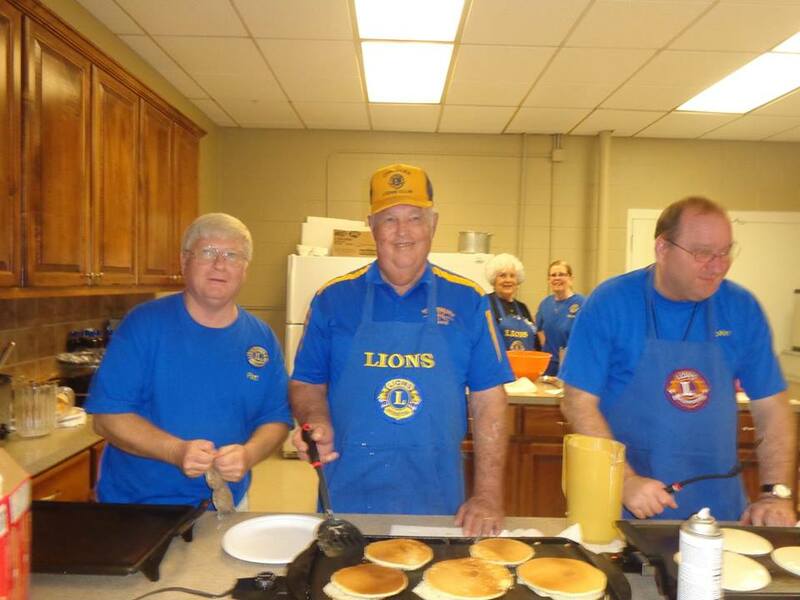 Lion Darla Fink, chairperson, had a little help from her husband, Charlie (above), when Chandler Lions Club held it Pancake Supper Nov. 14. 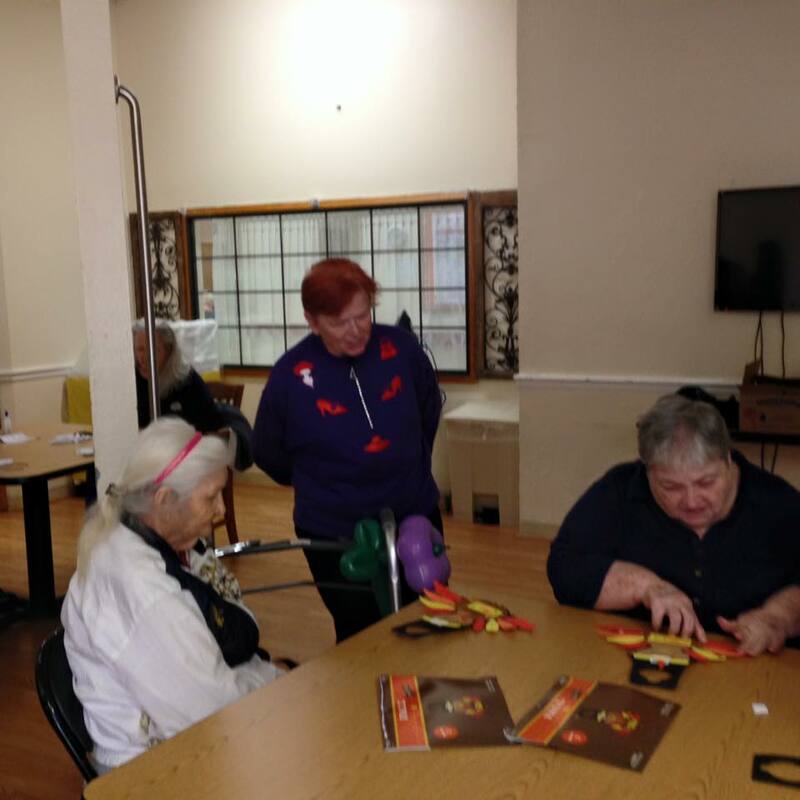 Club members came and decorated the Community Center with fall colors for one of their main fundraisers of the year. 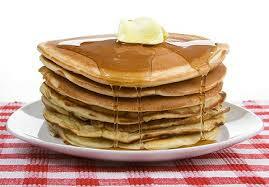 Another pancake supper is scheduled close to Easter. Also planned for the future is the Chili Supper in January. 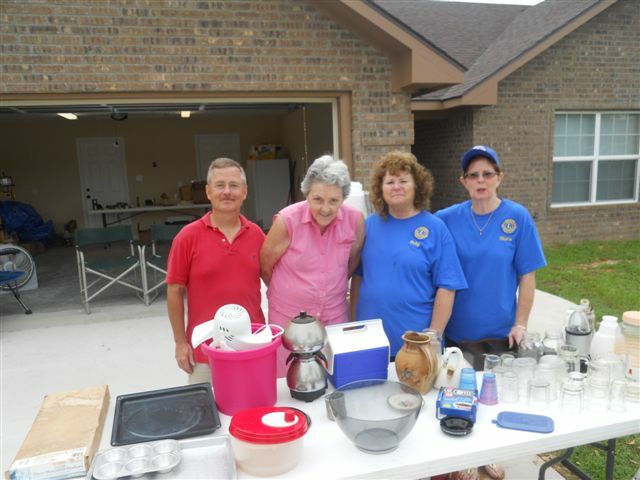 "Lions Club helps with Garage Sale"
The Chandler Lions Club spent the weekend helping Phylis Hart down size some items from her home. Picutred are Lion David Patterson, Phylis Hart, Lion Ruby Simon and Lion Gloria Estes. Not pictured is Lion Jim Simon. Hart recently moved into her new home that was not finished by the builder. The sale and donations allowed Hart to install a fireplace and a mailbox as well as other unfinished items.